Presenting simple methods, especially in terms of soil arrangement, to control drought and desertification. The UN maintains that 1.5 billion people are affected by desertification. Desertification covers the entire process of major land degradation, with deserts being the ultimate stage. The resources presented in this sheet are targeting local players above all, especially farmers in regions affected by desertification. More than 110 countries have arid land that runs a potential risk of desertification. Asia, Africa and Latin America are the regions most under threat from these phenomena. Two thirds of the African continent are made up of arid lands or deserts. Africa has vast expanses of arid farmland, three quarters of which approximately are already being degraded by varying degrees and half is in danger. Asia has 1.7 billion hectares of arid, semi-arid or sub-humid land, caused primarily by deforestation. Nearly a quarter of Latin American and the Caribbean is covered by desert or arid land. Arid or desert land becomes unsuitable for raising livestock or market gardening and as such is responsible for increased poverty and insufficient food resources. These techniques involve first and foremost the rural environments of arid areas (i.e. over 291 dry days a year), semi-arid areas (i.e. between 101 and 290 dry days a year) or sub-humid areas (i.e. less than 100 dry days a year), where prevention work is essential. It is more efficient and above all cheaper to prevent desertification than to fight it, as soil rehabilitation is most often drawn-out, costly and even impossible. There is no standard technical solution to control desertification : Every place and every situation require specific solutions. This sheet will simply focus on a few of the most frequently used methods. The aim of dune fixing is to stop the sand advancing into areas still covered with vegetation. The first stage in the process is to build linear mechanical obstacles (barriers, fences of dead wood, etc.) perpendicular to the direction of the prevailing winds. A draughtboard system can be envisaged when the wind comes from different directions. This first stage aims to reduce wind speed and cause moving sand to accumulate. Subsequently, the sand is stabilised definitively by planting perennial plants whose roots will fix the recently formed dunes. Various species of trees or perennial grasses can be used depending on the environments ; for example, in Mali, mainly Tamarix aphyla, Balanites aegytiaca, Euphorbia balsamiphera, Prosopis juliflora, Acacia radiana, etc. are found. Windbreaks make an effective contribution to reducing the effects of wind erosion and thus limit desertification. Windbreaks are mainly created with hedges. A good hedge windbreak must filter the wind, not stop it completely. If the hedge is designed to stop the wind, it protects the land over about twice its height but then creates strong turbulence which can prove harmful. A windbreak hedge with about 50% permeability can protect the land over about ten times its height. This can be achieved by deciduous plants with leaves that fall every year. Forestation and reforestation are effective ways of controlling desertification. The trees have the advantage of retaining the moisture, reducing the wind that causes the erosion and fixing the land in which they are planted. The reforestation can do without irrigation once the rainfall exceeds 300 mm a year and provided that the rain water is redirected correctly. On the other hand, below 300 mm, extra watering is necessary which can be provided by a number of locally-available methods. The most frequently planted species (especially in Mali) are eucalyptus, neem, terminalia, fig, tamaris, acacia, shea, néré or fruit trees. It is essential to set up an efficient management system for the natural vegetation hand in hand with the reforestation. This will not only protect soils but also offer wood and forage resources and forest products other than wood. This leads to a succession of parallel actions to avoid putting too much pressure on the surrounding environment. Make sure not to overgraze lands with fragile vegetation ; limiting wood cutting to what is strictly needed whilst leaving the young trees time to develop sufficiently before they are felled or avoiding picking too much will all help to maintain the original vegetation. The reforestation process requires a great deal of time and resources to repair the damage suffered. Maintaining the natural soil cover can therefore prove more efficient and less costly. Agro-forestry involves planting trees on farmland. The trees protect the crops by acting as windbreaks or by shielding them from rain or too much sunshine. In addition, as the tree roots grow deep into the earth, this encourages rainwater infiltration and thus helps to top up the groundwaters. Agro-forestry can therefore reduce the impact of too much or too irregular bad weather in arid areas. The trees provide regularly and reliably substitution products such as fruit, animal forage and heating wood whilst acting as plant cover. The advantage of this method is that it encourages the sustainability of production and alleviates the pressure on local resources. In some cases, the introduction of versatile trees or shrubs can reinforce the measures to maintain soil fertility or conserve its humidity. Although essential in controlling desertification, it remains the most specific and most complicated problem. A few possible actions are the use of mineral fertilisers rather than chemicals, practising crop rotation and diversification (cereals/legumes) and educating populations in how to manage agro-pastoral resources. One possible technique is to retain the rainfall during the rainy season by building small dykes (about 30 cm high) to force the water to infiltrate the land. A thick layer of straw is laid as mulch at the start of the dry season which keeps the land cool until the sowing season. The SOS Enfants Internet site listed in the final section of this sheet provides information on this topic. 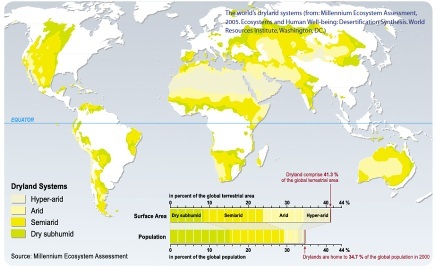 The main difficulty with desertification control methods lies in the fact that there is no universal technique to be applied. The solutions to be introduced are usually very specific and depend strongly therefore on places and climatic situations. The costs are very difficult to assess given that very different techniques and responses to specific situations are involved each time. It is normally advisable to favour prevention methods over rehabilitation, as this can be a very lengthy and costly process. Maintaining the initial plant cover is therefore vital. Similarly, care must be taken not to put too much pressure on the environment by allowing animals to graze excessively, to respect the soil load capacity, to diversify the productions and adapt the irrigation techniques to avoid leaving the soil wanting for nutrients. In Niger, where desertification is mainly caused by overgrazing and deforestation, five million hectares had greater plant cover in 2003 than in 1975 thanks to a national reforestation campaign. This reforestation is essentially due to protective measures introduced by some four million farmers who have also applied better livestock-rearing practices. The results of this campaign have been far more significant than for many other projects carried out in Africa. Similarly, studies in Turkey have focused on the possibility of reintroducing the saffron flower crop instead of cotton as it only consumes 10% of the water required for a cotton crop and is an excellent source of added value. - Nature Vivante (Living Nature) : the section on desertification offers a good inventory on the topic : causes, consequences and socio-economic impacts, affected or threatened regions and controlling this phenomenon.http://www.naturevivante.org/documents/unccd.pdf.